Taking a trip to Virginia Beach? The ocean isn&apos;t the only place to experience unforgettable water sports. Take in some of the best nature Virginia has to offer right here in Chesapeake. A short drive from the Oceanfront, Chesapeake offers 22 miles of wind-free, gentle waterways ready for you to sink your paddle into. Kayak your way across pristine waters filled with wildlife and teeming with adventure. Getting your kayak rental set up is easy with Adventure Kayak Tours. 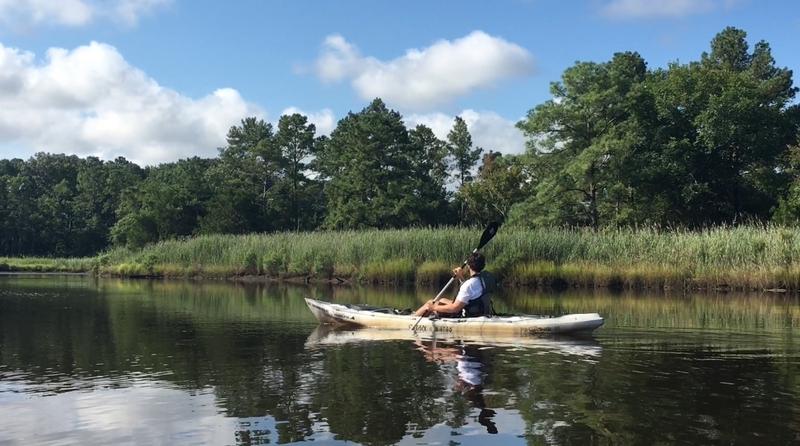 Take an expert-led tour through coastal water or flatwater, or have the kayak dropped off to you at a variety of locations. Best of all, Adventure Kayak Tours offers their tours and rentals year-round. Chesapeake&apos;s beautiful outdoor scenery also makes a great backdrop for family photos or the perfect profile picture. From spring to winter, there&apos;s never a shortage of authentic experiences in Chesapeake for people of all ages. When you kayak in the Northwest River or Lake Drummond, you&apos;ll notice the water is an amber color. This natural color comes from tannins, which keep water fresher for longer periods of time, making Chesapeake&apos;s waterways some of the purest in the world. While you&apos;re visiting Coastal Virginia, don&apos;t miss out on the incredible kayaking Chesapeake has to offer. Hop on in and let the moments begin.